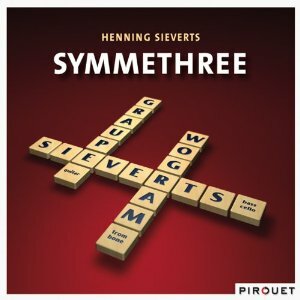 Jazz Station - Arnaldo DeSouteiro's Blog (Jazz, Bossa & Beyond): Instrumental CD of the Month - "Henning Sieverts: Symmethree"
Instrumental CD of the Month - "Henning Sieverts: Symmethree"
A truly perfect album. Great interplay in astounding 10 tracks (all composed by Sieverts, with "Nine on Twelve" and "Nine O.M." based on a symmetrically constructed nine-tone scale developed by French composer Olivier Messiaen that always fascinated Sieverts); great mix with Wogram's trombone on the right channel, Graupe's guitar on the left, and bass (or cello) in the middle. With these three musicians, it all sounds incredibly easy - the themes and motifs bubble out like water from a wellspring. The listener never senses the kind of effort that can go into playing pieces of this sort of difficulty, simply because these three musicians' music has a lot of spirit and soul. This music is fun and beautiful! The internationally acclaimed bassist, cellist, and composer Henning Sieverts has appeared on over 100 CD productions, including the Pirouet CDs "Glow," "The Inward Song," "Soprano," "Serendipity" and "Mirage." Sieverts has recorded eleven albums under his own name; among them are the Pirouet albums "Symmetry," "Blackbird" and now "Symmethree." Sieverts has been honored with numerous prizes and awards, including the first prize of the International Society of Bassists Jazz Competition (1991), the Bavarian State Music Award (2004), the New German Jazz Award 2009, and the Echo Jazz Award 2010 as best player for his Pirouet CD "Blackbird." Henning Sieverts has played with hundreds of musicians, among them such major players as Benny Bailey, Phil Woods, Marc Copland, Roy Hargrove, Ngyen Le, Richie Beirach, Jim Black, Julian Arguelles, Marc Ducret, John Hollenbeck, Achim Kaufmann, Christof Lauer, Jean-Marie Machado, Michael Moore, Tom Rainey, Brad Shepik, Andy Sheppard, Tyshawn Sorey, Chris Speed and Norma Winstone. Since 2003 Sieverts has been a regular moderator of the jazz show at the Bavarian radio. Compilation of the Week - "Selectro"
Win tickets to Jean Rollin's "Fascination"
Barbara Morrison returns to Steamers tonite! Dannielle DeAndrea live @ Steamers, tonite! SHM-CD of the Month - "Fuse One"
CD Reissue of the Month - "Caldera: Sky Islands"